The Hawker Siddeley Nimrod MR is a four-engine long-range maritime patrol aircraft produced by the British manufacturer Hawker Siddeley Aircraft Ltd., later BAe, British Aerospace. The major role of the Nimrod MR was anti-submarine warfare (ASW) also operated as a signals intelligence platform (SIGINT/ELINT) and in search and rescue service (SAR). The Nimrod was only operated by the Royal Air Force. The Nimrod MR was developed from the de Havilland D.H.106 Comet with major modifications of the airframe and replacement of the turbojet with turbofan engines. The variant Nimrod R1 is a ELINT platform. The Nimrod MR2 is a updated variant with in-flight refuelling cabability. 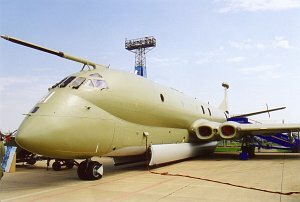 The further upgrade project Nimrod MRA4 was cancelled in 2010.